Inspired by my love of architecture, home decor and design, I’ve decided to create a new series titled UR HOME ENVY. In this series, I’ll focus on beautifully designed homes around the world and what makes each home so aesthetically pleasing. I’d love to hear what you like and don’t like about each home in the comment section as well! The first home in our UR HOME ENVY series is based in São Paulo, Brazil and was designed by the architecture firm studio MK 27. Where do I even begin? This three-level penthouse is the perfect culmination of earthy, jungle vibes and clean mid-century modern design. 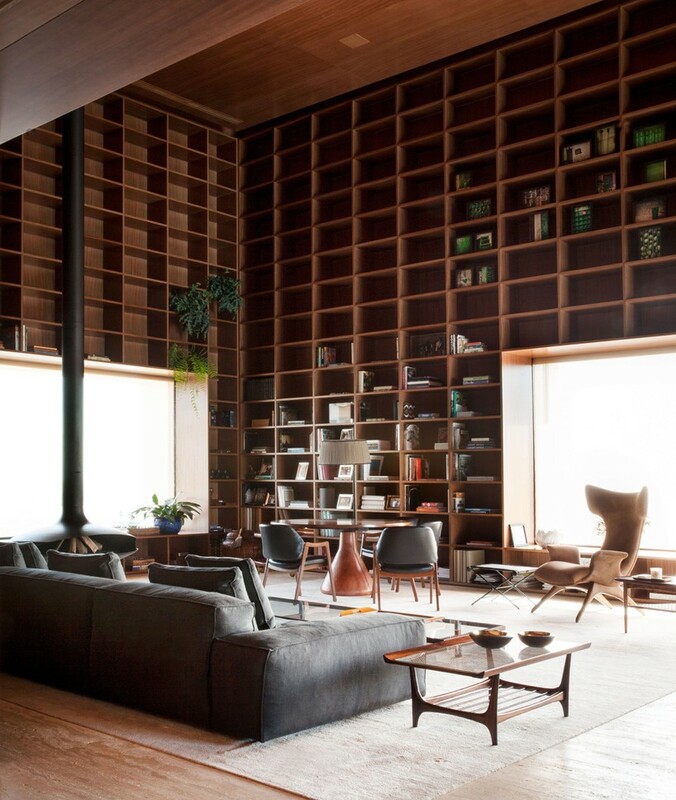 The first thing I noticed about this home was it’s library lounge. Decked out in floor-to-ceiling bookshelves, this is my favorite room in the house. the large-scale windows balance out the rich late wood tera panels creating a feeling of warmth and coziness throughout the room. Since I’m obsessed with reading, I feel like this is where I’d spend the majority of my time. With enough seating for a handful of guests, it also is a great room for entertaining friends. The bedrooms of the house are located on the first floor, on the second floor you’ll find the kitchen, home office, dining room and living room, and on the third floor, you’ll find the library, the spa, a gym, covered pool and garden. This penthouse literally has everything you could want in a home. The covered pool looks refreshing and the garden has a very serene but modern vibe to it. The hallways through out the apartment double as a gallery space for the homeowner’s art collection. When I see this penthouse, I think of the stylized film “A Simple Man” by Tom Ford. It exudes that level of style and class. View the penthouse below.